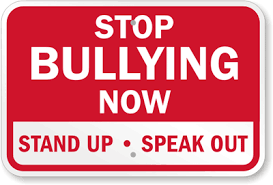 ​Bullying is unwanted, aggressive behavior among school aged children that involves a real or perceived power imbalance. Are there different types of bullying? When and Where Does Bullying Happen? No single factor puts a child at risk of being bullied or bulling others. Bullying can happen anywhere—cities, suburbs, or rural towns. Depending on the environment, some groups—such as lesbian, gay, bisexual, or transgender (LGBT) youth, youth with disabilities, and socially isolated youth—may be at an increased risk of being bullied. How Should you Talk To Your Kids About Bullying? ​Parents, school staff, and other caring adults have a role to play in preventing bullying. They can: Clicking on the hyperlinks will take you to the www.stopbullying.gov website where each of these methods are discussed in more detail. Model how to treat others with kindness. How Should You Respond to Bullying? How you respond can make an impact on bullying over time. Find out what you can do to stop it on the spot and support the kids involved. Every day, kids see bullying. They want to help, but don’t know how. Here are a few simple and safe ways that your child can help someone who’s being bullied and be more than a bystander. If you would like to report inappropriate behavior or a bullying situation that you witnessed or experienced at North Nodaway schools,, you are encouraged to contact a teacher, counselor, or administrator. Your identity will remain confidential. The administration will follow up on all concerns immediately. If the school isn't aware of a problem, they can't fix it, so please report the problem!!! You may also call the Bullying Prevention Hotline for Missouri at 1-866-748-7047. This hotline provides students and parents with a place to anonymously report bullying, and also provides access to resources. If you would like to leave an anonymous tip, please use the form below.